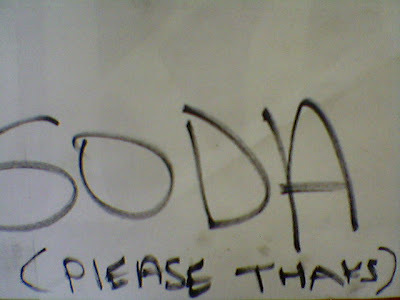 Elizabeth found this note taped to a soda machine at a junk yard in Provo, Utah. Could this author have been trying to save space by making the L lowercase, and also excluding the N in THAKS? That would be the clever thing to do. 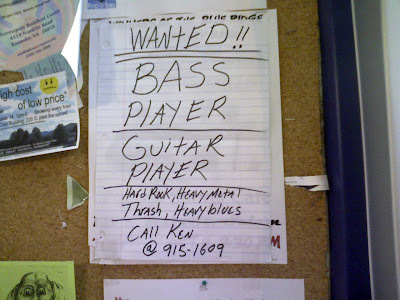 Drew sent in this bulletin board want ad for a BASS PlAYER and GUITAR PlAYER. Besides the lowercase L's, there are other hints of dysgraphic action going on in Ken's writing, like the special WANtED headline. I hope the band they form is better than the letter case consistency in their want ad. Fellow blogger from complainaway took a photo of this tee-shirt in a head shop, and the store owner came running out to protest. 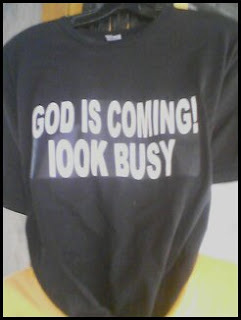 Was he embarrassed because GOD IS COMING, but this shirt is not worthy of His greatness, because it uses a lowercase L improperly? This kind of ungodly error is what happens when you try to lOOK BUSY, but really aren't. I came across this box of Koo-Koo Pebbles cereal designed by Kevin Schmid randomly on the web. I love the packaging, everything is good ... except for that RICH BlOODY FLAVOR! That one slip of the lowercase L is a real cereal killer. Happy New Year! Sorry for the lack of posts in the last few weeks, hopefully 2008 will bring many more. I'll kick off the new year with flowers, AlSTROMERIAS to be exact. 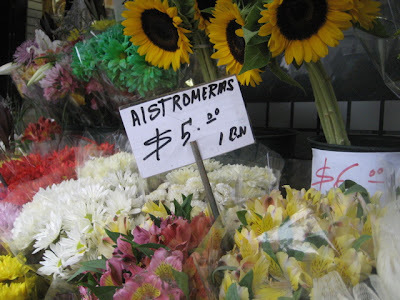 I had never heard of these "Lilies of the Incas" until I looked them up to check the spelling, but took the photo anyway, figuring that "Aistromeria" was an unlikely name.